On December 27, in the eastern Kunar region of Afghanistan, ten Afghans, eight of whom were schoolchildren, were dragged from their beds and shot by US forces during a nighttime raid. Afghan government investigators said the eight students were aged from 11 to 17 years. This incident is but one example of countless atrocities US military personnel have carried out in the occupation of Iraq and Afghanistan. In Iraq, US military personnel torturing detainees in Abu Ghraib, Iraqi civilians suffering the violence meted out by US forces, or US forces detaining schoolchildren in Baghdad, the list of atrocities is seemingly endless. 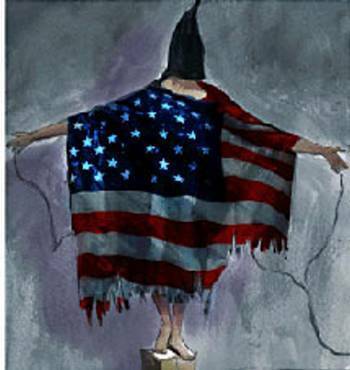 Dr. Stjepan Mestrovic, a professor of sociology at Texas A&M University, has written three books on US misconduct in Iraq: “The Trials of Abu Ghraib: An Expert Witness Account of Shame and Honor,” “Rules of Engagement? : Operation Iron Triangle, Iraq,” and “The ‘Good Soldier’ on Trial: A Sociological Study of Misconduct by the US Military Pertaining to Operation Iron Triangle, Iraq.” He has three degrees from Harvard University, including a Master’s degree in clinical psychology, and has been an expert witness in psychology and sociology at several Article 32 hearings, courts-martial, and clemency hearings involving US soldiers accused of committing crimes of war in Iraq, including the trials of prison guards involved in the Abu Ghraib scandal. Truthout recently conducted an extended two-part interview with Dr. Mestrovic. Truthout: Can you describe the process that occurs within the US military that leads to a mindset that allows atrocities to occur? How is it that soldiers commit atrocities like murdering an unarmed 75-year-old Iraqi man? Dr. Mestrovic: This mindset is rooted in American history and might be peculiar to it. By way of metaphor, it might be characterized by a line from a You Tube video, “Startrekking Across the Universe,” wherein the fictional Captain Kirk says: “We come in peace, shoot to kill.” In the classic work, “Democracy in America,” Alexis de Tocqueville captured this seeming contradiction in American “habits of the heart” with regard to Native Americans, slaves and all those deemed as “other.” Tocqueville points out that unlike the Spaniards, English or French conquerors, the Americans went out of their way to pass laws and enact treaties to justify their mistreatment of others. So, for example, slavery was considered immoral, but was legal. Similarly, extermination of the Indians was immoral, but the government signed treaties before it broke them. So-called “witches” were executed only after they were given trials and assigned lawyers. And so on. It seems that Tocqueville captured an important aspect of American culture that continues to this day. Fast-forwarding to World War II, the US engaged in numerous acts that some historians and lawyers believe could have been called war crimes had the US lost that war. Examples include the firebombing of German and Japanese cities, and of course, dropping the atomic bombs on Hiroshima and Nagasaki. Fast-forwarding further to the Vietnam War, the US established policies of “search and destroy” missions in “free-fire” zones. The important point is that these acts were justified by all sorts of legal jargon about “status-based” targets (which apparently means that the target is considered “hostile” simply by existing, and therefore constitutes a potential threat). This sort of legalizing of acts that otherwise might be considered atrocities has continued in the current, long war on terror. For example, it is no secret that John Yoo and other White House lawyers went out of their way to make torture seem lawful. In this and other acts, the government continues to behave in the manner described by Tocqueville. Focusing directly on the incident in question, there is no doubt that the Army regarded the killing of the unarmed Iraqi man as lawful. The ROE for that mission was to kill every military-aged Iraqi male on sight, and that is what the soldiers did. The victim was pre-designated as a “status-based” and “hostile” target based upon existing American military law. Some may regard the killing of the man as murder, because he was unarmed and did not show any signs of hostile intent. None of that matters from the point of view of the mindset we are discussing here. In fact, all the military as well as civilian attorneys with whom I have spoken agree that had the soldiers carried out their ROE that day and killed on sight all the Iraqi males they encountered that day, no charges would have been pressed against any of them. Their “mistake,” from the mindset being discussed here, is that they showed mercy and took some of the Iraqis as prisoners, and then killed them. From their point of view, they were still carrying out the original ROE by killing the prisoners. In fact, they were told not to take any prisoners. But from the legal standpoint of the American cultural mindset, there are legal rules for treating and killing prisoners, which are different from killing “status-based” or pre-designated targets. The overall point is that the mindset which led to this atrocity is that the victims were pre-designated as targets in a lawful manner. But this mindset only raises numerous legal, cultural and moral issues, and does not close the door to them. Dr. Mestrovic: One could start with the observation by Samuel Stouffer in his 1949 classic, “The American Soldier,” which still holds. Namely, Stouffer observed that the US Army, like all armies, is archaic and authoritarian in its structure while its soldiers come from a democratic society. Democracy and authoritarianism do not mix, and lead to dysfunction. Stouffer found that commissioned officers are treated almost like royalty whereas low-ranking soldiers are treated as less than full Americans. I have found numerous, glaring examples of dysfunctions in my research based upon this basic contradiction that was uncovered by Stouffer. For example, I found it shocking that US soldiers at Abu Ghraib slept in jail cells (just like the detainees did) and did not have access to toilets, not even portable toilets. Part of the democratic spirit is that all persons should have equal access to basic human needs. Shocking testimony by the supply officer at the Abu Ghraib trials was that the soldiers at Abu Ghraib did not have access to suitable or sufficient food, water, light or sleep. From Stouffer’s perspective, this state of affairs can be described as positively medieval: the “leisure class” (commissioned officers) looked after its needs and interests, but did not look after the interests of its low-ranking soldiers. So much attention has been paid to the photographs regarding the mistreatment of “detainees” at Abu Ghraib, that hardly anybody has noticed the Army’s mistreatment of its own soldiers during this mission. In fact, I have come across systemic dysfunctions in numerous war crimes cases. Sleep deprivation is a huge problem. Sleep should be considered a necessity like food and water, because chronic sleep deprivation for soldiers leads to errors in judgment, including moral judgment. But soldiers told me that they routinely slept less than four hours per day. Another issue is PTSD. I have come across numerous cases of soldiers who were diagnosed with PTSD who were not treated and who were sent out on combat missions despite this diagnosis. Why aren’t commanders and commissioned officers mindful of the basic, human needs of their soldiers? Part of the answer might be that in a truly democratic society, individuals would protest and demand their rights to basic human needs, including sleep and treatment for PTSD. But the Army is an authoritarian society, so apparently soldiers have no recourse but to obey. These are among the observations that have led me to conclude that the Army is dysfunctional. Truthout: Please give some of examples of this. Dr. Mestrovic: I’ve already given some examples in relation to Stouffer’s observations about the American soldier in combat. Let me give a few more examples with regard to military law. In general, the US soldier gives up many Constitutional rights by joining the Army. The court-martial system is as archaic and authoritarian as the rest of the army structure. Military judges and prosecutors are not the equals of the accused, but are his or her military superiors. That fact alone changes the dynamics of the military legal process. Let me put it this way. It is a cruel irony that alleged terrorists such as KSM who will be tried in civilian US courts will be granted more Constitutional rights than soldiers who are accused in the military court-martial system. Another cruel irony is that several corporate law firms have volunteered their services, pro bono, in defense of alleged terrorists at Guantanamo and elsewhere, in the interests of protecting Constitutional rights. But to my knowledge, not a single corporate law firm has volunteered to defend the Constitutional rights of US soldiers. Most people do not think about the huge discrepancy between the democratic structure of American society versus the authoritarian structure of the American military. I should end with a quote from a soldier interviewed by Stouffer: “We just want to be treated like Americans again.” I believe Stouffer’s observation still applies.